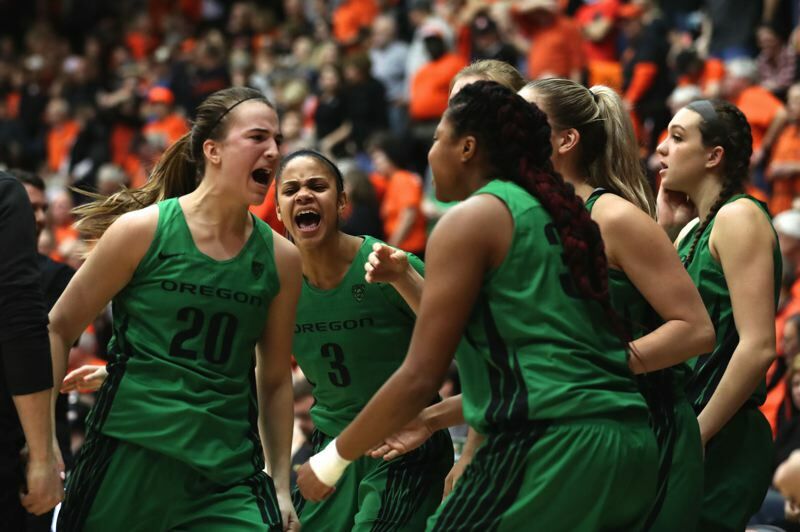 EUGENE — Something seemed wrong after the clock ticked down to zero Sunday night at Matt Knight Arena, cementing Oregon's 75-63 win over Oregon State in women's basketball. Sure, there was joy from the Oregon players and the partisans among the 7,249 in attendance. But shouldn't the UO students have stormed the court in celebration? After seven years and 15 games, wouldn't you think? "The curse is over," one security guard put it as fans left the arena. Oregon State's 14-game lock on the series ended in the 100th renewal of the rivalry, two nights after an epic overtime win by the Beavers at Gill Coliseum. The last time the Beavers had lost to the Ducks was on Jan. 23, 2011, in Scott Rueck's first taste of the Civil War rivalry in his first season as Oregon State's coach. Oregon came into Sunday's game with the higher national ranking (No. 7 to No. 18 for Oregon State) and the better record (17-3 overall and 6-1 in Pac-12 play to OSU's 14-4 and 5-2). But the three-time defending Pac-12 champion Beavers had history on their side. They didn't have Sabrina Ionescu, though — the biggest reason why the Ducks are sitting alone atop the Pac-12 standings at 7-1. The 5-10 sophomore point guard didn't score 35 points as she had in Friday's 85-79 loss at Gill, but her imprint was all over Sunday's win. With OSU defenders Katie McWilliams and Kat Tudor taking turns blanketing her every move, Ionescu still scored 15 points, dished out 11 assists (would have been several more had not teammate Ruthy Hebard had an uncharactistically poor shooting game) and basically dared the Beavers to beat the Ducks again, which they couldn't. "We don't pay too much attention to what the streak is, but it's nice to shut their crowd up, shut their fans up," Ionescu observed afterward. "We're coming every game we play them now. The rivalry is huge. It was fun at their place, and even more fun here. That might be because we won." Ionescu had great help Sunday from Satou Sabally, a lanky 6-4 freshman left-hander from Germany who had narrowed her college choices down to Oregon and Oregon State. Sabally, like Ionescu, played all 40 minutes, scoring 21 points on 9-for-15 shooting, including three 3-pointers. "Every time we were off her, she made us pay," Rueck said. "Satou was a difference-maker tonight." Sabally was also a big part of an Oregon defense that focused on slowing down Tudor, who had bombed in a career-high 34 points Friday night, and 6-5 senior center Marie Gulich, who had scored a career-high 26. With Sabally following Tudor to the 3-point line and the Ducks double-teaming Gulich at every touch, Tudor and Gulich each scored four points in the first half. "(The Ducks) didn't want Kat to shoot Friday night, either, and they tried to defend Marie one-on-one," Rueck said. "This time, the double came quicker. "We didn't move the ball as well tonight. We didn't see the floor nearly as well. We had a hard time getting Marie position. They got her off the block, and then the double came, which turned her into a passer. They played very aggressive tonight. That was the difference — they were the aggressor." Oregon also got a big game out of 6-5 sophomore Mallory McGwire — daughter of former Seahawks quarterback Dan McGwire and niece of baseball's Mark McGwire — who scored 14 points on 7-for-9 shooting and had primary coverage on Gulich. "Mallory set the tone not just at the offensive end, but defensively did a great job with Gulich," Oregon coach Kelly Graves said. "She is the best post player in the conference, and we had her off her game a little bit. I credit Mallory. She didn't let (Gulich) get deep post-ups. She held her ground." By intermission, Oregon's lead was 40-18, and for all intents and purposes, the game was over. "The first 20 minutes is as good defense as has been played in this arena since I've been here, and probably ever on the women's side," said Graves, in his fourth year at the UO helm. "I'm proud of how hard we worked and how in tune we were with each other defensively." Oregon State was 6 for 24 from the field in the first half. "(The Beavers) hit seven 3's in the first quarter Friday night," Graves noted. "Tonight, they were 1 of 7 (on 3-point attempts) in the first half. There's your difference. (In Friday's game), they beat us from the 3-point line 39-12. You're not going to win any place with (those numbers), and certainly not against a good (OSU) team in Corvallis." Oregon's advantage was 50-23 four minutes into the third quarter, and visions of Oregon State's 84-49 loss at UCLA on Jan. 6 came to mind. This time, the Beavers didn't turtle, scoring 45 second-half points and drawing to within 12 points early in the fourth quarter, while never quite making the Ducks sweat. "Last game against UCLA, we just kind of gave up," said Tudor, a 6-foot sophomore. "Tonight, we didn't give up. We kept on fighting till the end. We're growing. We're going to be better from here." Tudor scored 13 of her 17 points in the second half, and Gulich came on to finish with 16 points, 10 rebounds, three assists and three blocked shots. But Oregon State shot only .373 from the field, making 7 of 21 3-point attempts. The Beavers entered the game leading the nation in 3-point percentage (.430) and were third in field-goal percentage (.505). Oregon shot .484 from the field, including 6 of 14 from beyond the arc. "The story of this game is we could not score (in the first half)," Rueck said. "There was no pressure on (the Ducks). The basket was like the ocean for them. Friday night, they had a lot of pressure on them. They were behind and they had to take tough shots. There were players who didn't quite want the ball the same. "Tonight, everybody wanted the ball. They executed early, and then everyone got comfortable." Oregon got it done with senior sharpshooter Lexi Bando on the sidelines with an apparent stress fracture of a foot. And with the 6-4 Hebard, who came into the game leading the nation in field-goal percentage (.680), making 2 of 15 shots from the field. Even so, the Ducks won handily. "They're really good," Rueck said. "They have weapons everywhere. Everybody talks about Sabrina, but there are weapons all over the floor. And they defended well tonight." The Beavers didn't come close to the performance they'd put in at Corvallis two nights earlier. "We were just a little overwhelmed," Gulich said. "We haven't been playing that well away from home. We can't get into a rhythm quite as well. We're trying to work on that as a team." "That's our hurdle right now — being tough on the road," Rueck said. "We're inexperienced. That was evident in the first half tonight. We weren't as tough as we needed to be. We didn't handle the adversity early. We settled early for shots. "I liked our grit and our toughness in the second half. We're getting better. This team has grown up a lot in the last two weeks. We learned some tough lessons in L.A. They've applied those lessons positively. I'm proud of the way we fought tonight. We could have hung our heads, but we kept fighting and showed a lot of heart." This has the makings of a fierce rivalry for years to come. It hasn't taken long for Graves — who has a little Rick Majerus in him while patrolling the sidelines — to build a national-caliber program. Oregon State was already there under Rueck. They now coach the two youngest teams in the Pac-12. Oregon will lose only Bando off this year's team. Oregon State's only senior is Gulich. Both teams have highly touted recruiting classes coming in and a ballyhooed transfer (point guard Destiny Slocum from Maryland at OSU, forward Erin Boley from Notre Dame at UO) waiting in the wings. "We're really good," Graves said. "We're going to continue to be really good. Oregon State's really good. (The Beavers) are going to continue to be really good. I anticipate this is going to be quite a rivalry." Said Rueck: "These are two programs that are used to winning. We're both excited about who we have coming in the future. We'll continue to have good teams. It's fun." And now, after Oregon has finally broken through, the rivalry is on. But then, nobody beats the Ducks 15 times in a row.